Well regardless of your opinion on this statement I hope you all have your spuds in and are eagerly awaiting that first new potato of the year. At Woodville we got distracted with one thing and another and so even though we got the First Earlies (Colleen and Maris Piper) in on time we only managed to get the main crop (Cara) in last week. I had the bed covered for the winter, so it was weed free and warm, a perfect start. Or maybe not! Jim Cronin gave a talk on soil at the Clare Garden Festival and advocated not covering soil with plastic or any other mulch. Instead he suggested sowing a green manure and he made sense. Apparently covering the bed results in giving slugs and snails a wonderful place to hide up for the winter, lay their eggs and generally increase the population. Whereas by first mulching with compost and then sowing an over wintering green manure a healthy enriched soil will result. I will say that when we pulled back the plastic we did find lots of fat juicy slugs. More about green manures next blog. In Woodville we plant potatoes using the dibber method. This means making a hole with the dibber and dropping the chitted potato (yes we do chit them) into the hole and covering it over. This is easier on the back and the soul. 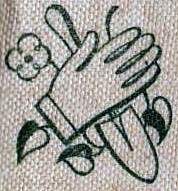 We mark the line with string and dib and drop. We leave enough soil between rows to earth up the soil as the season goes on. Last year we used grass cuttings as suggested by Bob Flowerdew however may be its our wet Irish weather but we found that the slugs and snails loved it. I have successfully tried seaweed (no need to wash the seaweed) and lazybed methods both used in this bloglink https://www.quickcrop.ie/blog/2014/02/growing-potatoes-in-seaweed/ and for those with a green field the lazybed gets you started on creating a new bed, potatoes are great for leaving behind a lovely crumbly soil. What ever method you choose its all a waiting game now, with a little bit of earthing up. So what is your favorite potato and have you any tips on what works for you? Let me know. Welcome to Woodville Walled Gardens first blog of 2014. Spring is definitely here, in the last 10 days the garden has changed colour completely with rapid growth in all areas. As the garden wakes up so too do the gardeners nemesis. 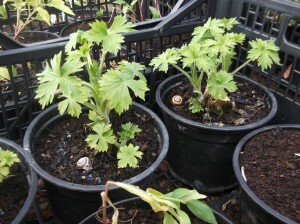 Look out for Delphiniums, make sure they are not munched by slugs and snails as they emerge. How you deal with these critters is between you and your maker. Rest assured they have an eye on your Delphiniums. Slug and snail activity is really bad at the moment with no frost to keep them in check. Tidy your beds making sure they have nothing to hide under. This article by Kate Rogers Gessert will give you a well rounded insight into the life and possible deaths (if that be your philosophy) of slugs. Put in plant support s and mulch well and they will reward you with those magnificent spires. As soon as they finish flowering cut back to the ground, give them another feed and you will get a second flowering in September. 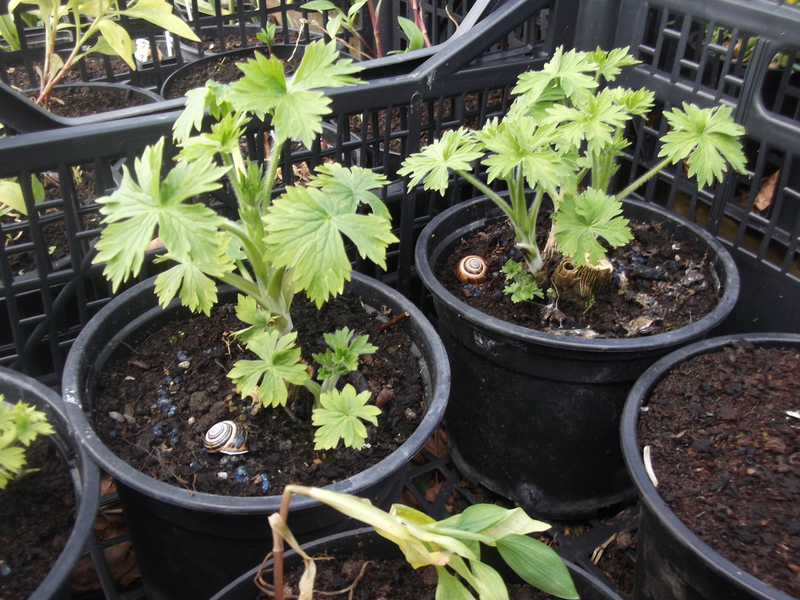 If however you find yourself worn down in defense of your Delphiniums and decide enough, never again why not try Monkshood- Actonitum, sometimes referred to as poor-mans Delphinium. We have a few varieties at Woodville, one of which is ready to flower in April, one mid-summer and best of all Bressingham Spires, which has fabulous foliage all summer and then flowers though August, September and October. Why not give your mother the gift of flowers all year long with a membership to Woodville Walled Garden. Only twenty euro for a single membership or fifty euro for a family membership. A gift that lasts not just for a day but all the way through to next years Mothers Day! Gifts are not just for Christmas. Imagine my delight when last week, I arrived to Woodville, and found waiting for me not one but two gifts of Snowdrops. One gift of three large pots, unnamed, not yet identified from Nenagh, thank you Moira. Gift two a little pot of the much coveted ‘Castlegar’ thank you Dorothy. Originally from the Mahon Estate discovered by Keith Lamb. This delicate beauty can flower early, mid December, which makes it all the more welcome in this bleak time of year. I would like to thank everybody for their donations of snowdrops in the last year, I eagerly await my little treasures. Lets talk spuds! What are you growing this year? (first and second earlies should be chitted now in a sunny and frost free place). Hope its a great year. Have you some spare time and would like to develop your gardening skills. Why not volunteer at Woodville Walled Garden. This magical place will inspire you to new success in your own garden. Meet like minded people and have fun!!!! Woodville Walled Garden, Kilchreest, Loughrea, Co. Galway will open from Thursday to Sunday 11am to 4pm for the month of February. A special tour of the garden will be provided each day at 2pm by the head gardener. Woodville Walled Garden once owned by a brother of Lady Augusta Gregory and the adjoining stables exhibits old photos and artifacts belonging to her family. 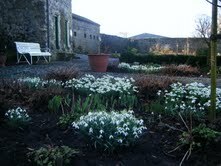 The walled garden is an enchanting place to visit and see the first early spring bulbs in full bloom. Just 20 mins drive from Galway City.